You don't need to be an artistic expert to enjoy everything offered by Shanghai's eclectic art districts. As I mentioned in my earlier post about Red Town, I love exploring the isolated escapes hidden within the city's crowds. The M50 Art District is no exception, as it offers a variety of art galleries that allow for an entire afternoon of exploration. I especially love the extensive graffiti wall that leads directly to the district's entrance -- I'm not sure if this is intentional, but it is the perfect prelude to the hidden area. Since Shanghai's weather has been warming up significantly, I went for comfort when dressing for my afternoon at M50. This off-shoulder top is ideal for the city's bipolar weather that seems to shift seasons throughout the day. While the exposed shoulders keep me cool during the day, the long sleeves ensure that I can handle the chilly evenings. Plus, I just have a weakness for the off-shoulder silhouette. I paired the top with these faux suede shorts for my take on a bohemian-inspired look. A girl can try, right? Wow, very cool photos :) Love this post! The art district looks amazing, definitely gotta visit there one day! Loving your necklace and shoes, and your take on a boho-inspired look is working! cute look! Love your sandals so much!! Your top is amazing! Love it! Such a cute look! Love that top! Such a cool place! I love the outfit too! That picture with the black and white photos in the background is amazing. Beautiful shots! So in love with that top! Beautiful look, lovely photos, enjoy the weather. you look great, i love the top and the shoes; it's a beautiful spring style! 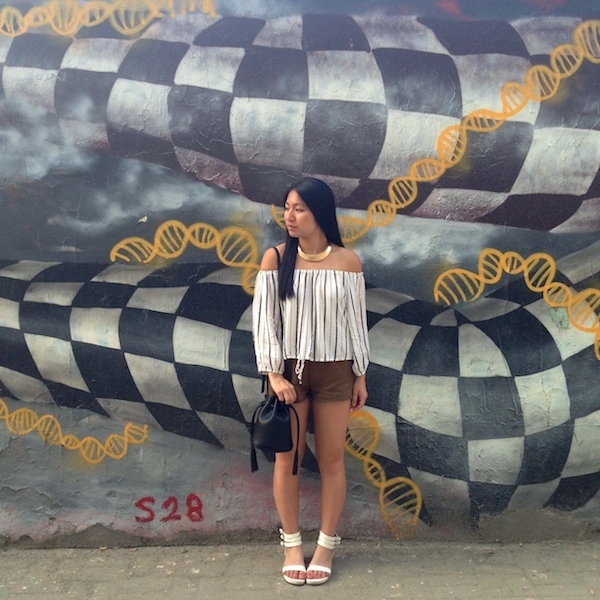 whoa, the art district looks amazing and so does your outfit! I'm a big lover of all things art and this place is no exception! I am loving your travel diaries babe! The weather has been bipolar here as well! Great look.